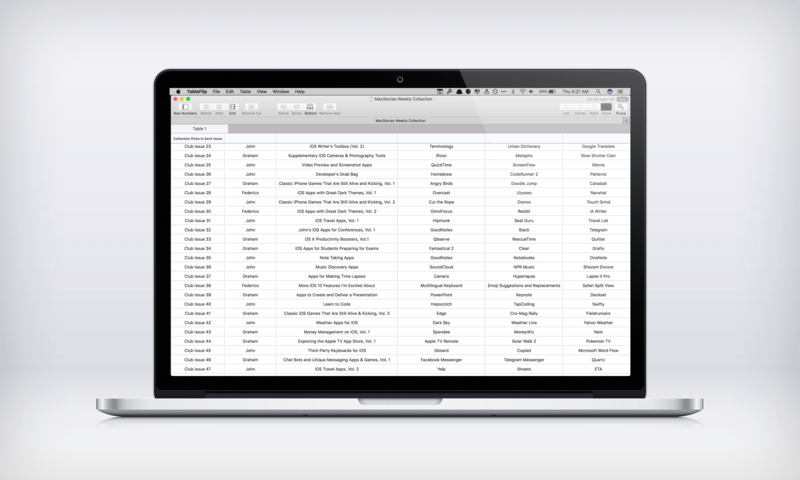 TableFlip, by indie developer Christian Tietze, does something no other Mac app I know of does – it lets you create and edit Markdown tables in a familiar spreadsheet-like interface. Table syntax is part of Fletcher Penny’s MultiMarkdown extension of John Gruber’s Markdown format for displaying HTML in easily readable plain text. MultiMarkdown’s syntax for tables is handy for short tables, but can get unwieldy and complex with larger tables. TableFlip fixes that by letting you flip between a plain text document and a fully-rendered and editable version of your table. TableFlip is equal parts viewer and editor. You can open a plain text document simultaneously in a text editor and TableFlip, which displays the HTML-rendered table. Each time you save the plain text file in your text editor, the changes are reflected in TableFlip, but you can also edit and save your table in TableFlip and the changes are updated in your text editor. TableFlip has lots of great keyboard shortcuts that help you move quickly through a table. 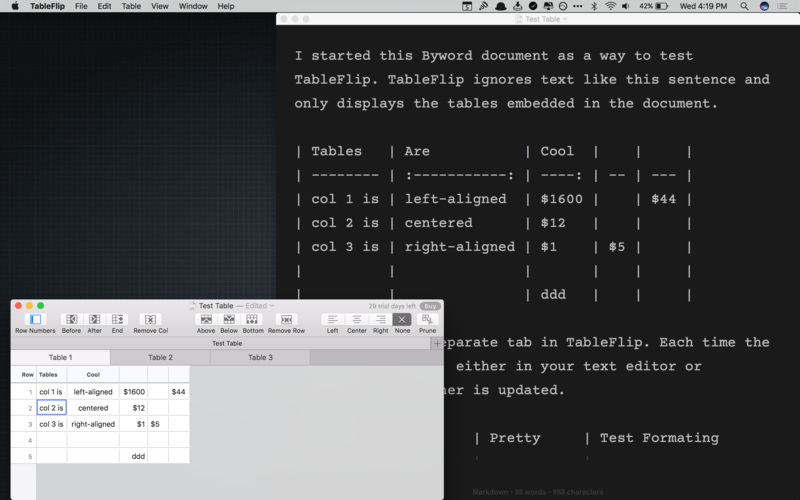 As a viewer, TableFlip is focused – it only displays the tables in your document, not the text. Each table gets its own tab in familiar spreadsheet fashion. This is a great design decision because it lets you put your prose to the side and use TableFlip to concentrate on ensuring that your table data is correct and properly formatted. TableFlip's singular focus on tables falls short in one respect though. Formatting, like italics or emphasis, that is applied to text inside a table cell is not rendered in TableFlip. 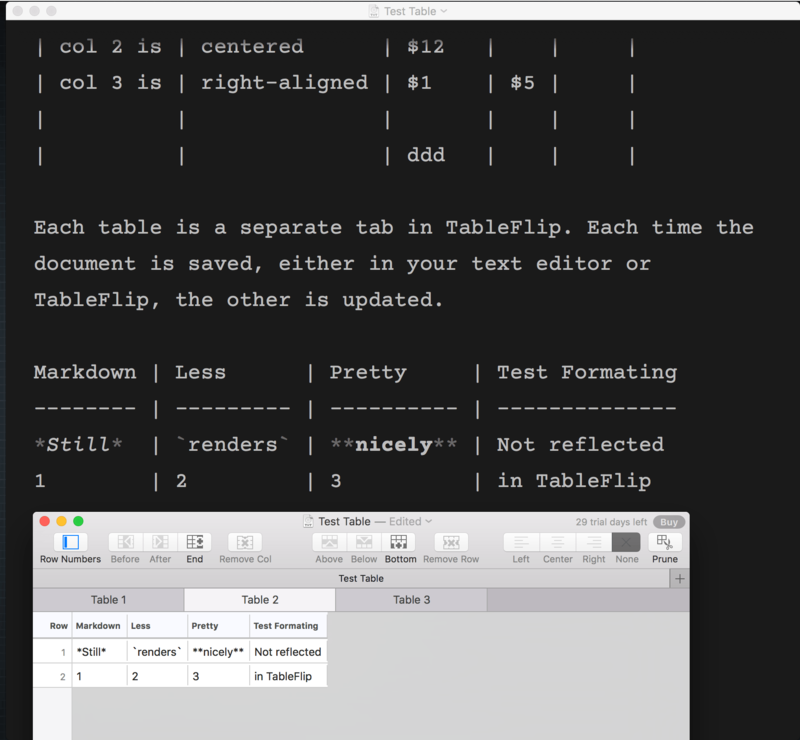 As an editor, TableFlip makes creating and editing tables a breeze. TableFlip's toolbar has buttons for adding and removing columns and rows, aligning text within cells, and pruning multiple unused columns and rows all at once.1 You can also 'auto-grow' a table using the arrow keys. If the active cell is in the last row or column of a table, arrowing to the right or down will add columns or rows to the table. If you add data to a cell, the auto-grown rows and columns become part of the table, otherwise they disappear when you select a different cell. It's a little touch, but one that makes extending a table fast. Formatting of text in cells is not displayed in TableFlip. I don't have occasion to use tables in my writing often, but that is precisely why TableFlip is so valuable. I don't use tables enough to remember the correct syntax. That means tables slow me down and take me out of the flow of writing whenever I need one. TableFlip eliminates that roadblock, so I can keep writing without missing a beat. TableFlip is available directly from Christian Tietzen for $15.19 until October 15, 2016, after which it will $18.99. Until October 31st, you can also get a coupon for $15 off for helping spread the word about TableFlip.